Have you ever wondered how heart valves work? The best way to look at them is that they act like doors. They close to keep blood from flowing back into the area it came from and open at just the right time to allow the blood to move forward into the next area. Each valve is made up of flaps or cusps that, when working properly, open and close together to create a tight seal. The heart valves are basically a way to keep the blood flowing efficiently in the right direction. 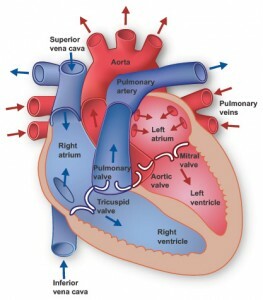 There are 4 valves in the heart. 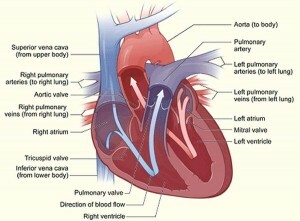 Two are between the heart and its surrounding major vessels and the other two are between the chambers of the heart. The pulmonic valve lies between the right ventricle and the pulmonary artery. It opens to allow blood from the right ventricle into the pulmonary artery and closes to prevent that blood from flowing back into the right ventricle. The aortic valve is between the left ventricle and the aorta. It opens to allow blood into the aorta and closes to prevent that blood from flowing back into the left ventricle. The tricuspid lies between the right atrium and right ventricle and the mitral valve between the left atrium and ventricle- both of these open to allow blood to flow from the atria to the ventricles below and close to prevent that blood from traveling back up into the atria when the ventricles pump the blood to the vessels. When the atria squeeze, the tricuspid and bicuspid are open to allow the blood to flow from the atria to the ventricles. When the ventricles squeeze, the aortic and pulmonic valves open to allow the blood from the ventricles in and the mitral and tricuspid are closed to prevent the blood from the ventricles from going back up into the atria. There are several issues that can occur with the heart valves. The most common are stenosis, regurgitation, and prolapse. • Stenosis: This refers to a valve not opening properly. This occurs because the valve thickens, stiffens or some of the cusps may be fused together. The thickening/stiffening mainly is caused by advanced age- where the cusps develop calcifications over time. People can also be born with stenosis or it can be causes from rheumatic heart disease. Cusps fused together are usually something that a person is born with. Because the stenosis causes the valve’s opening to be smaller than usual, the heart has to work harder to get blood through. Aortic stenosis, specifically, causes the left ventricle to thicken and enlarge, eventually weakening it. • Regurgitation: Unlike stenosis, regurgitation occurs when the valve doesn’t close properly, allowing blood to backflow into the area it just came from. It also allows blood to go into the area ahead before it is needed. This, in turn, can cause the heart to work harder in general. Several things can cause regurgitation including, high blood pressure, infection, and coronary artery disease. • Prolapse: This issue mainly affects the mitral valve. Another term used for this is “floppy valve syndrome”. With prolapse, the two cusps of the mitral valve do not close or seal evenly or properly. It is caused by tumor-like collagen growths on the cusps. It usually only occurs in 2-3% of the population and can be genetic. The effects it has on the heart are similar to that of regurgitation. Many times this condition is harmless and needs no intervention. In many cases, valve issues cause no significant symptoms and, sometimes, people do not even know they have them. However, if a valve issue becomes prominent enough to cause symptoms and problems, the main two remedies are either surgical repair or surgical replacement.